Gone are the days when you had to hire a friend’s pick-up or squeeze your bike into your car to move from one place to another. Renowned companies like Thule, Tyger Auto, Yakima, Saris and Allen Sports have good news for SUV owners; there are special racks for your vehicles. The racks are of so many designs and types that you will find yourself confused on which one to settle on. Having conducted a thorough market research, we have compiled the best 6 we could find and an accompanying buying guide to ease your shopping experience. Feel free to read on. Question: What is the best 4-bike rack for SUV? ​Can I use a two-bike rack to transport one bike? ​Is it possible to replace parts of a rack? 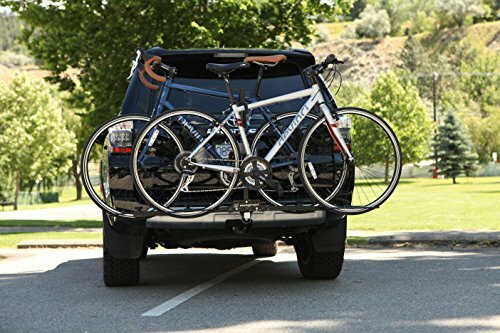 ​Do trunk bike racks work on SUV? ​Can I wash my car with the rack on it? 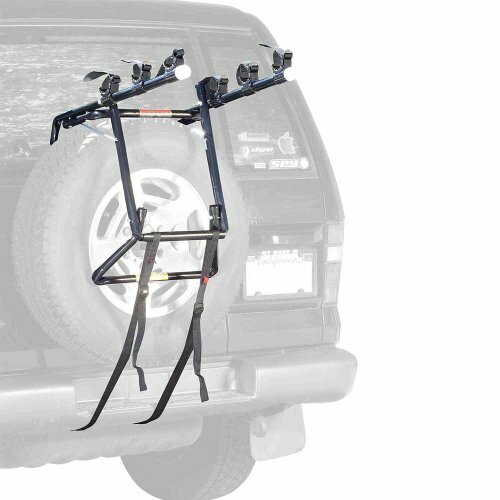 Swagman’s XC2 model number 64650 is a hitch mount bike rack best known for its firm grip on bikes. It is the best for you if you want a frame that can hold 2 bikes upright at the back of your car. The hitch mount rack from Swagman has upright ratcheting arms that enable it to hold any frame size below 59cm. Its frame grip arms conserve the paint coating and finish on your bike; hence it keeps looking good. The rack also protects your car from scratches using its cushioned hooks. The bike rack has foldable arms. If you need to access the rear of your car, fold the center arm to make it simple for you. This feature also makes it easy for you to carry and store the rack when you uninstall it. 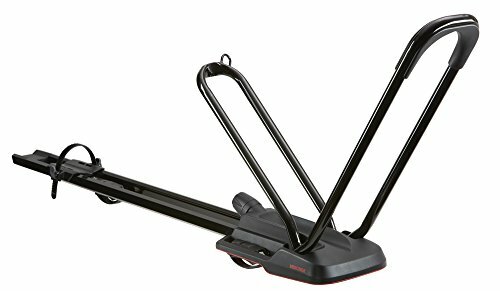 Swagman XC2 rack has an in-built anti-wobble hitch device that keeps your bike stable when on the move. If you want to enhance the security of your tandem, you will have to buy a locking pin and security cable separately. If your wheels are of fat tires bikes, purchase fat-wheel trays too; this rack’s design holds 20” and 29” tires. The ease of transporting the rack and storing it is convenient, frequent bikers. The foldable arms make this and accessing the rear a simple thing to do. Also, the stand has cushioned hooks and soft frames to protect your car and bike respectively. It is convenient for you to carry BMX, Mountain, cruiser, full-suspension and children bikes on this rack. You have to follow the assembling instructions carefully; otherwise, you could break this fantastic rack. Moreover, if you want extra security on your bike, you have to buy the cable lock and locking pin separately. Allen Sports Deluxe Rack model number 303DB is ideal for bikers who love seeing their bikes in good shape all the time. It can hold 3 bikes firmly on rough roads without degrading their quality. Allen Sports put a lot of attention on the security system of this rack for it and the bikes on it. It has a patented design that has your bikes help up high such that they do not touch the road or the heated exhaust. These bikes cannot be stolen since the rack has a highly-secured tie-down system at your disposal. It is effortless to install: hook it over the spare tires. It fits on most of the externally mounted spare tires, including those with over-the-tire third brake lights. Be sure to check if it is compatible with the dimensions of your car. The rack also comes with a Deluxe Spare Tire Bike Carrier. Mounting the rack on your SUV takes seconds, so no need to worry about the time and effort wasted in the installation process. It also highly secured tie-down system you can use to keep your cycle safe. It is easy for long-distance travellers to worry about the firmness of this rack; hence your thought will convince you to buy an additional bar to attach to your bike. This adds hidden costs to your budget. Saris Bones Trunk Rack model number 805BL is among the few bike racks recommended by Bicycling Magazine Safety. It is the most durable rack known, having been constructed from 100% recyclable rust-free material. The rack looks good. Its material can be recycled when it is done being useful as a truck rack. As if that is not enough, it cannot rust hence making it long-lasting and sturdy. It has injection-model arms and legs to support it firmly when you mount your tandems. You will notice that is has rubber feet and vinyl-coated hooks to protect your vehicle from abrasion. It also has anti-way coated straps that protect the finish on your bike and give it that secure hold you have been seeking. It does not take forever to install this rack. It has ratcheting hold-downs that are easy to adjust. It is also easy to carry and store, since you can fold it up nicely and put it in your garage. The rack is made from recyclable material. This is pretty awesome for environment enthusiasts. The fact that it does not rust makes it look appealing for long, and can serve its purpose forever. The rack is also the best if you want a secure hold for your bike. Besides SUVs, you can mount the rack on hatchbacks and sedans. This makes its use diverse on your car and cars of people who associate with you. After using it for a while, you will notice that there are marks at the back of your car. They are as a result of the constant contact the hooks have on your vehicle. The hooks are not padded. Yakima Highroad model number 8002114 is a roof-mounted bike rack and is best for anybody who values the security of their bike while on the move. It can only hold one bike at a time. This roof mounted bike rack holds one cycle at a time. It takes a few minutes to install it, and barely requires any tools to do so. You will hit the road sooner than you expected because no time shall be wasted. The perfect frame condition of your tandem shall remain like that when using this rack. This is because even after mounting your tandem, there is no direct contact between the roof rack and your frame. This nullifies any chances of scratches and abrasion. The rack also has tight torque knobs that give it precision security. This and the two SKS locks in the rear clamp and one TailWhip bike cable lock are things no thief can conquer easily. Relax and drive. There is entirely no chance of your custom paint on the frame being scratched because nothing shall touch it up there. The bike you transport remains firm and secure as well, so you need not worry about it falling off the car roof. The fact that you have to lift your bike that high to mount it can demoralize you, more so if you are a regular biker. You will either need to be well fed to raise the cycle or call for help each time you want to transport your bike. Thule’s T2 Pro XT model number 9034XTS (size 2”) is the best rack for cyclists with diverse types of bikes to carry. It is designed to accommodate 2 bikes and can carry 4 If you purchase the add-on which is compatible with 2” receiver only. The T2 Pro XT rack is easy to attaché onto the hitch, and you do not need to have tools for this. It allows you to access the rear of the vehicle easily because you can tilt the hitch switch lever down to create that space. You can also tilt it up when not in use, eliminating the need to keep uninstalling it each time. For security fanatics, this is the rack for you. It has an integrated 24” cable lock that secures your bike to the rack and built-in lock cylinders to secure your rack to the car. When not in use, this cable lock retracts into the ratcheting arm. You can mount mountain, fat tire, downhill, and carbon frame bikes on Thule’s rack. It can accommodate20” to 29” wheels and 5” tires without making contact with the frames; its ratcheting arm is well-sized. Also, the bikes have enough clearance when putting on the rack, so they shall not bump against each other. No touching. The rack has inbuilt lock cylinders and a cable lock to keep it safely hooked on your vehicle with the bikes secure on it. It saves you the trouble of getting your own security system. Moreover, this rack protects the bike frames and the paint on your car. The weight of the rack is rather much (52 pounds), so you cannot keep carrying it and installing it all the time. It is not for the faint-hearted. The rack is also not suitable for bikes with extensive fenders. This great TG-RK1B102B model from Tyger Auto is the best for cyclists who value the look on their bike and car. It is equipped with soft cradles and padded frames to eliminate chances of abrasion on your two loves. The rack gets to you when it is assembled fully, thus saving you the hustle of having to go through the assembling manual. Installing on the vehicle is easy. In case you are stuck in this part, refer to the DIY instructions it comes with. Really simple. The construction of the rack is sturdy and can last for a long time if you maintain it well. It has safety straps that hold onto your bike firmly. 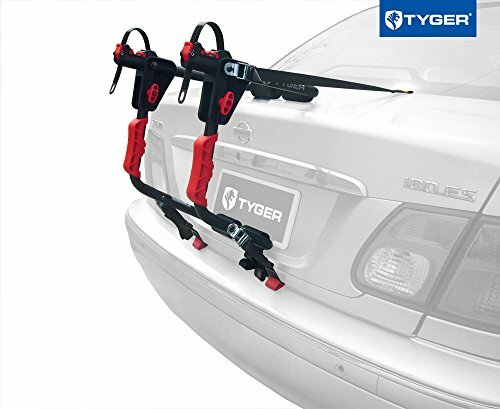 With this feature and the padded lower from that keeps your bike from touching the car makes Tyger Auto’s rack worthy of your money. You can rest assured that the frame of the bike you transport shall remain protected. This is as a result of the rack having individual soft cradles. It also has a black E-Coating to keep it from rusting. The rack comes 100% preassembled and has a DIY instruction manual that is easy to understand. This saves you a lot of money and effort you could have spent trying to get your way around it. The rack also has safety straps that keep your bike held firmly, thus making it possible for you to relax and drive. Sometimes you could feel that your bike has not been held as tightly as you would desire, hence lowering your confidence to use the rack over long distances on bumpy roads. To boost your confidence, you can buy tightening gear for it. You cannot install it on vehicles longer than 18ft. If we all bought bike racks for the looks and how cool they seem to be, we would have truck bed bike racks on sedans and SUVs, because nothing else matters but the looks. However, there are more things to consider when purchasing your bike. You need to consider how often you will use the racks, how many bikes you want to transport, and your budget, among others. These make your experience with the stand more personalized and fun. Let’s dig into factors to consider. There are four types of racks you can use on your SUV; strap-on trunk racks, roof-mounted, spare tire, and hitch mounted bike racks. Know as much as you can and make the best choice for you. Go for this type of stand if you lack a hitch receiver, want a lightweight rack and like your bikes held securely. This type is suitable for you if you do not transport your bike regularly. It is, however, not always lockable, cannot work if you have a spare tire on the back and could scratch your car. These are the most stable type that can let you use the rack for other cargo as well. They do not obstruct your rear view while driving and they are pocket-friendly in their prices. However, you will need a lot of muscle to lift your bike that high, and they are not suitable for vehicles with curved roofs. They are what you use when you have one or two bikes to carry and want to evade any tiresome installation procedures. These racks come at affordable prices and are best in protecting the coating and finish on your bicycle and SUV. Nevertheless, they have limited anti-theft options, make you remove your tire covers and obstruct the rear view of your taillights. They are used on SUVs with hitch receivers and are the best for you if you do not want to use so much muscle power fitting it. They come in different styles and are not permanently attached to your car. Their downsides include blocking you from using the rear of your, and they extend the vehicle length. Are you a groupie ride kind of a person or more like the lone-wanderer in the woods? Some racks can accommodate just one bike, while others can hold up to 5. Choose one depending on how regular you use it, and be sure about it. If you are not sure, you can request for those with few slots that can be extended to accommodate more bikes and buy the extenders separately. Is riding your thing? Do you prefer the trails on the side of town and want to get there each weekend? If you are a regular transporter, go for racks that protect the paint on the care, as easy to handle and can be left on the vehicle so that you will not have to uninstall it each time. It, however, you do this once in a while, purchase a rack that is easy to store, carry and inexpensive. Most SUV racks are used for bike transportation only. The straps and frames cannot be used to carry any other cargo. You can buy such if you have space to take other things in your trunk. If you want one that can be used for more than one purpose or on any other place but the car, consult with your seller about this too. They are available. Your budget should control how much you spend on racks. There are those that come at high prices because of the company reputation, type of rack and material and technology used in construction. If your budget is fluid, buy any that suits that your needs without concentrating much on the price. If, on the other hand, you have a tight budget, get inexpensive options. They work too. Do you a lot to put in the trunk each time you transport your bikes? If you have to keep accessing the rear of your car, have this in mind and purchase a roof rack or a spare tire bike rack. These two do not interfere with your access. Nonetheless, if this factor does not matter or you do not have stuff in your trunk, forget this and shop. The Tyger Auto TG-RK4B102 Deluxe is the best 4-bike rack in the market. It has a sturdy construction and easy to install. It is also relatively cheap, compared to other racks of the same capacity. 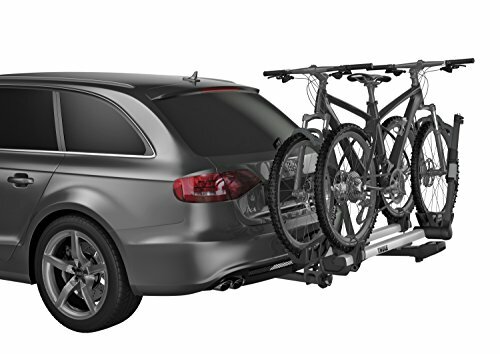 This rack is followed closely by ThuleT2 Pro XT 2 bike rack that can accommodate 4 bikes when you purchase a 2” extender for it or buy the Thule T2 Pro XT Add-on model. Of course, you can. Read the instructions manual carefully and mount the bike nicely, regardless of the type. Do not worry about an imbalance because by transporting a single bike; you are within the weight limit stipulated for the rack. Yes. You can order parts of a rack that you need to replace from your retailer, get it online or make an order from the manufacturers. Be cautious when replacing it to avoid spoiling any other parts. Absolutely! 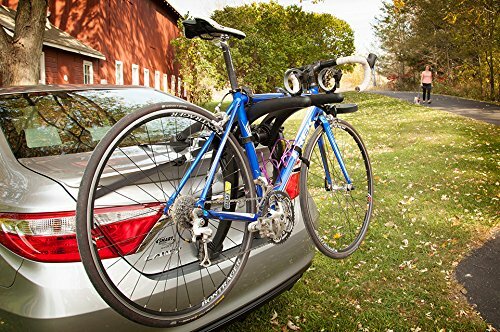 If your car lacks a hitch and crossbars, then trunk mounted bike racks are totally what you need. You can install them on the rear door or the hatch of your car. Moreover, they can be swapped between cars, so they are entirely a good option that works on SUVs. The dirt could end up under the soft pads of the racks, hence making it rough and scratching on your car. The rack can retain the water or soap and keep degrading in quality over time. Bike transportation has never been so easy. You can do it using your SUV in whatever style you want. When buying a suitable bike rack, have in mind the number of bikes you want to transport and the frequency of use. You should also consider what type suits you best and be clear on the amount of money you are ready to spend. Our best pick for SUV bike racks is Saris Bones 2-Bike Trunk Rack. It is durable considering that it does not rust, easy to install and made of 100% recyclable material. To spice it up better, it is stylish. We cannot wish for better a better trunk mounted rack than this one from Saris.